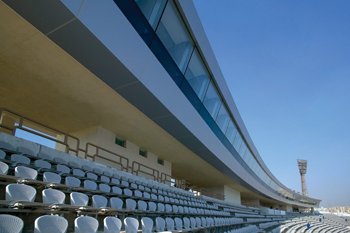 Reynaers’ aluminium systems employed in the construction of Cairo Stadium. REYNAERS Middle East indicates that the company achieved record sales in Egypt compared to the 10 countries in its Middle East portfolio. Since the launch of its operations in the capital Cairo a few years back, Reynaers Aluminium, the European aluminium systems supplier, has seen a continuous upward growth with regard to business development. Reynaers introduced its international standard products in 2006 to Egypt, which is described as one of the most progressive markets in the Middle East handled by its regional arm, Reynaers Middle East. “Despite the recent unrest in the country, this segment of the business has witnessed fluctuating but fairly upward turnover figures so much so that in 2014, the Egyptian market achieved record high sales for the region among 10 different countries in our Middle East portfolio,” said Ali Khalaf, managing director, Reynaers Middle East. With a population of approximately 100 million, the Egyptian market offers substantial potential both in the commercial and residential sectors, he added. “So whether it’s the Cairo Stadium, Wadi El Nile hospital building or Shadi Hani Villa, Reynaers caters to various types of projects as demanded by the equally diverse range of customers in this market,” said Khalaf. Its projects are spread over all major cities like Cairo, Alexandria, Hurghada, Sharm El Sheikh and even in neighbouring Sudan. Reynaers started business in Egypt by initially supplying curtain-walling system for the Cairo Stadium that was renovated for the Africa Nations football championship, which was won by hosts Egypt. The consultant for the project was Moharram/Bakhoum. Later in 2009, a country manager, Wissam Yanni, was appointed to look after business and further develop it in the area. Yanni has since spearheaded operations in the Egypt market. A branch office was officially inaugurated in 2012 providing full technical and commercial services to customers. Some of the landmark projects in Egypt include the Mall of Egypt with consultants MZECH/RMC; and Etisalat Telecom headquarters, Le Meridien Hotel and Damac Hydepark Mall with consultant ECG. Other notable projects include the PetroJet headquarters, Hazem Maher office building, Wadi Nile Hospital and Business Link, with Ennpi, Archilab, Dr Ahmed El Sherif and Madar respectively as consultants. Meanwhile, Waterway Mall (Raef Fahmi Architects), Amer Group headquarters (El Gabaly Architects) and Rashdan Developments (Aluvation Group) are some of the projects that are currently under construction. Khalaf said Egypt also has a promising residential market. The elegant Shadi Hani villa, Amr Nou villa and the M Abdel Salam villa are a few of the prominent high-profile villas that have employed various Reynaers systems. CW 50-HL ... an energy-efficient solution. Khalaf said that among the products that are popular in the Egyptian market are curtain-walling solutions, mainly the CW-50 SC. However, sliding systems like the CP 96 and CP 50 and the CS 59 windows and doors have been installed in various projects across the country. The region, he said, is also beginning to recognise the significance of energy-efficient solutions like the CW 50-HL and the BS 100 sun-screening systems. “As the economic scene improves in this part of the world, the scope for business appears all the more promising,” said Khalaf, adding that plans are under way to expand further with a dedicated warehouse thus strengthening the quality of customer service offered by the company. 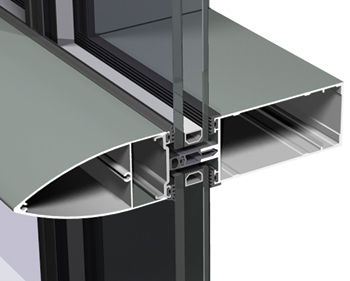 Reynaers is a leading European specialist in the development and marketing of innovative and sustainable architectural aluminium solutions for windows, doors, curtain-walling, sliding systems, sun-screening, conservatories, skylights, screens and systems to incorporate blinds and ventilation grids. Established in 1965 and headquartered in Duffel, Belgium, Reynaers has offices in more than 30 countries worldwide. Reynaers Middle East was established in Bahrain in 2004 to provide hi-tech aluminium architectural solutions for the growing construction needs of the region.